ALIEN WEAPONRY - Unveil New Video "Whispers"
Modern Trash Metal outfit, Alien Weaponry have released a brand new video "Whispers", taken from the upcoming album "Tū". The trio shocks and surprises audiences on a number of levels. ALIEN WEAPONRY's songwriting is complex, developed and highly political. Their live performance energy is startling, with just two fifteen-year olds commanding the front of stage as effectively as four- and five-piece bands three times their age. Many of their songs are in New Zealand’s native language, Te Reo Māori. 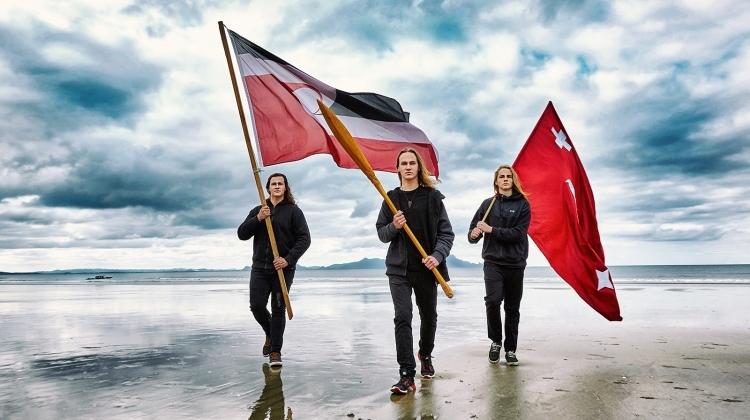 In fact, guitarist/lead singer Lewis de Jong (15) and his brother, drummer Henry (17), are of Ngati Pikiāo and Ngati Raukawa descent – they call themselves ‘Stealth Māori.’ They attended a full immersion kura kaupapa Māori (Māori language school) until they were seven years old, where singing waiata and performing haka were a daily routine. Also ingrained in their early learning were stories of New Zealand history from a Māori perspective. In September 2017, they won the prestigious „APRA Maioha award" for their song ‘Raupatu’ – a thrash metal commentary on the 1863 act of parliament that allowed the colonial government to confiscate vast areas of land from the indigenous Māori people. On 16 November, they took their places among NZ’s musical elite as nominees at the Vodafone New Zealand Music Awards. The combination of thrash metal with Māori history and language has proved popular. Their latest music video for RūAna Te Whenuahas more than a million Youtube and Facebook views, spent 2 weeks at no. 1 on Spotify’s NZ Viral chart, and hit no. 2 on the iTunes global metal chart (just behind Iron Maiden’s ‘Run to the Hills’). The band’s music has been playlisted on stations in New Zealand and around the world – from Scotland to Brazil, as well as the USA, Australia and Germany.